The Pleasant Bay 3-Piece Outdoor Synthetic Wicker Patio Bistro Set is the perfect place to sip your morning coffee from the comfort of your own home. This set includes two high back armed chairs with plush cushions and a table with a glass top. 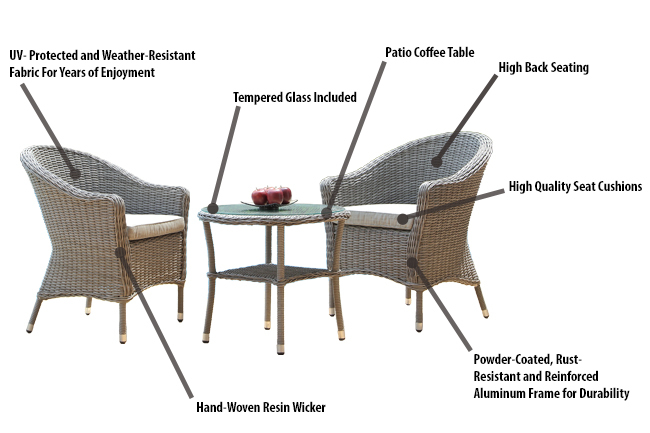 This Patio Bistro Set is ideal for your backyard, terrace or patio. Made suitable for outdoor use, this set features durable construction of weather-resistant, synthetic wicker and aluminum framing for durability. All pieces are hand woven using a half round and round style wicker which creates a visually appealing and high quality finish.